Shaun has received numerous awards for his success as an athlete and coach in the sport of wrestling over the last 35 years. He competed at the national level in freestyle and greco-roman wrestling from 1979-1999. In 1980, he started competing in judo and won his first provincial black belt title in 1985 and maintained a position on the provincial team until 1989. He is presently ranked as a Sandan (3rd degree black belt) in Judo and actively competes as a masters competitor in Judo. 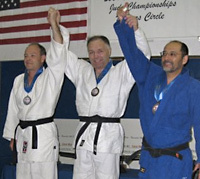 2008 Gold in American National Brazilian Jui Jitsu Championship for Gi and No Gi, Blue Belt, Senior 3 division. Shawn coached the Red Deer College team in 1977-78, in which he was named "Outstanding Wrestler" at the conference championship. He then joined the University of Alberta Wrestling team till 1981. He attended the World Wrestling Coaches Symposium at the 1982 World Championships and was an assistant coach and athlete with the program till 2009. This was only interrupted by a 2 year stint as the Head Coach in 1990-91. He was awarded the Glassford Award for Outstanding Contribution to University of Alberta Athletics and Excellence in Coaching in 1998, and was selected as "Outstanding Senior Wrestling Coach" by the Edmonton Amateur Wrestling Association in 1991. Due to his success as an athlete and coach at the local, national, and international level, he was inducted to the Edmonton Combatives Commission, Honor Roll in 2008.